A first birthday is cause for celebration, so don't let the day go by without recognizing the big milestone. A birthday card, whether mailed or attached to a gift, will spread birthday wishes to the birthday child and his or her family. Pick out one you can download and print at home -- an option that allows you to spend more time celebrating and less time driving to the store. The festive animal parade card above is a fun design sure to bring a smile to any little girl or boy's face. The cards below feature a sports theme and a princess theme. The parade card and sports-themed card can both be customized to include the child's name in the highlighted portions. All the cards can be printed using Adobe. These are half-fold cards and will print on both sides of the paper, so be sure your printer is set up accordingly. For basic printers, you may need to print the first page, flip it over, and then print the second page. Try a few test runs if you're not sure how to set your printer. 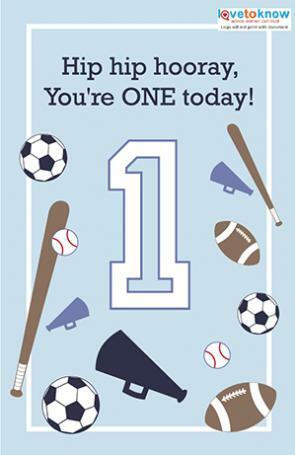 Click to download the sporty card. 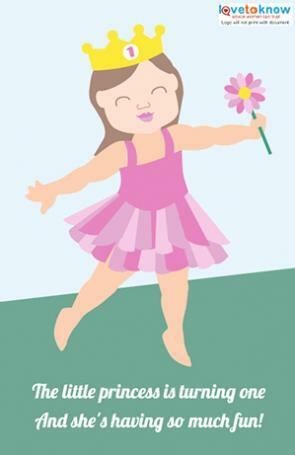 Click to download the princess card. Quality-Kids-Crafts.com has a free printable first birthday card featuring a single candle on the front and a festive first birthday saying on the inside. It prints in black and white, meaning you can add your own colors before or after printing to fit the party, envelope, or wrapping paper theme. GotFreeCards has lots of free card options that are great for kids, and all of them can be customized. Several feature cute and cuddly animals, like tigers, elephants, and ducks, perfect for an animal-loving first birthday boy or girl. Card size - Most half-folded cards will fit in a 5 x 7 envelope, but smaller ones might need special envelope sizes. Printer ink - Image-heavy cards, especially those with graphics on the inside, will take a lot of ink. Consider picking a heavier-weight paper and allowing each side to print and dry fully before printing the other to avoid ink smears. Birthday party theme - If you are giving the card at a party, take a look at the first birthday party invitation. If a particular theme is evident, like animals, characters, or even just a color, you can pick a card that reflects some aspect of that theme. Regardless of the card you end up choosing, you should add your own feelings about the birthday child in a message. 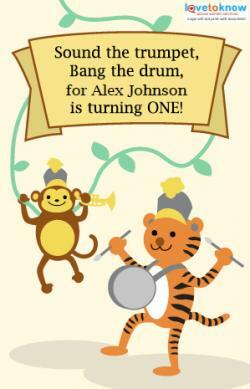 Consider including a special first birthday poem to add a personalized touch.